We appreciate your interest in our Sprinter® ink marking equipment. 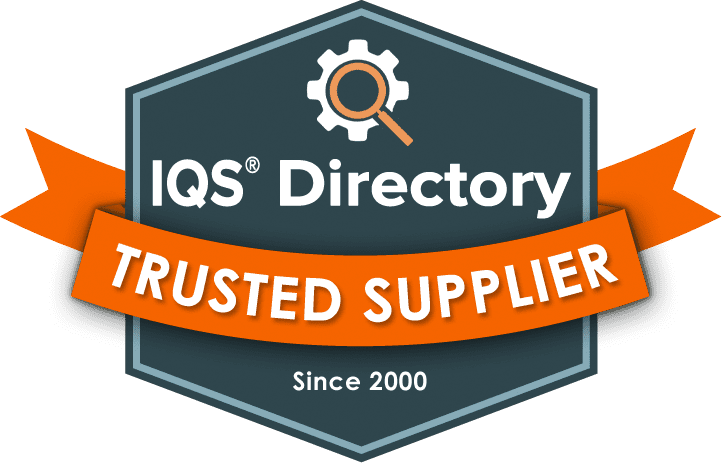 After you have reviewed the following literature, we believe you will find that the compact/simple design and unique patented reciprocating motion are well suited to satisfying your ink code-marking needs. It is our belief that Sprinter ink code-marking machines will complete your ink code-marking requirements more effectively and at less overall operating cost than any comparable system. The machine tool standards of quality manufacture assures years of machine use with little maintenance. We would be glad to work through an analysis of your marking requirements and provide a recommendation on the appropriate Sprinter equipment and accessories at your convenience. In the meantime, if there are any questions not answered in following literature please feel free to contact us. 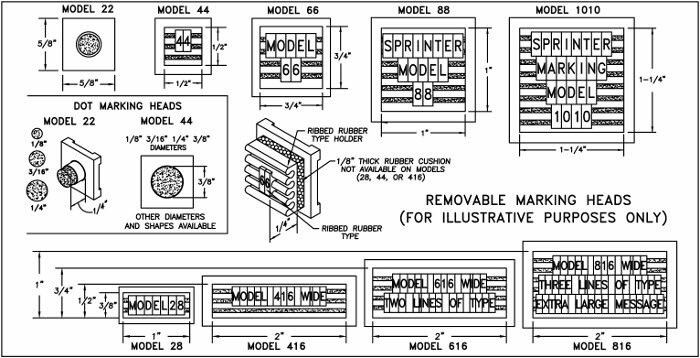 Sprinter machine model selection is based upon choosing the smallest marking head that will deliver the required message. Illustrated below are the nine standard machine model marking head formats based upon print size area. NOTE: Rubber Type shown above is not for character sizing purposes. Refer to the chart below. For messages that are assembled using rubber type kits (letter / number kits), consideration has to be given to the number of lines and the number of characters per line to properly select minimum size marking head / machine. Greatly oversizing the machine for a small message can increase costs per marking impression without corresponding benefit. Rubber type is secured by ribs (see above drawing) which lock into a ribbed rubber mat. All rubber type has a minimum of two ribs. The seven sizes of type described below contain two ribs. Type 5/16" or larger (not illustrated below) contains a minimum of three ribs thus reducing the lines of type that can be secured in a fixed area. If 5/16" or larger type is being considered consult factory for guidance on machine selection based upon message size content. A couple of the most common sizes of type used are 1/8" and 9/64" which typically provide a very clear, easily read ink code-mark on a variety of surfaces. The number of characters per line varies depending upon the size of the type selected (larger height type has wider width) and the specific type character (e.g. "W" is wider than "I"). The chart below shows approximate character height for the letter "S" for seven common type sizes. The chart also provides a guide to both typical ("8" was selected) and maximum ("W" is widest) characters that can be accommodated by a specific Sprinter Model. It is recommended to select the next larger machine model on tight fits. 22 4 350 6" 5/8" 2"
28 6 350 6" 1 3/8" 2"
44 8 350 8 3/8" 3/4" 2 3/8"
66 13 250 9 3/8" 1" 3"
88 16 225 9 3/8" 1 3/8" 3 5/16"
1010 22 200 9 3/8" 1 5/8" 3 9/16"
416 10 200 8 3/8" 2 1/2" 2 3/8"
616 15 175 9 3/8" 2 1/2" 3"
816 18 150 9 3/8" 2 1/2" 3 3/8"
Ink Supply: Models 22/28/44/416 use a 1/4 oz ink supply bottle while models 66,88,1010, 616, and 816 use a 1/2 oz bottle. Filled bottles typically provide up to 125,000 imprints of an average length message size on Model 66. Average number of imprints can vary with message size and model selection. Most models can be extended in the rod stroke length. Additionally the marking head itself can be extended for difficult to reach or recessed areas. 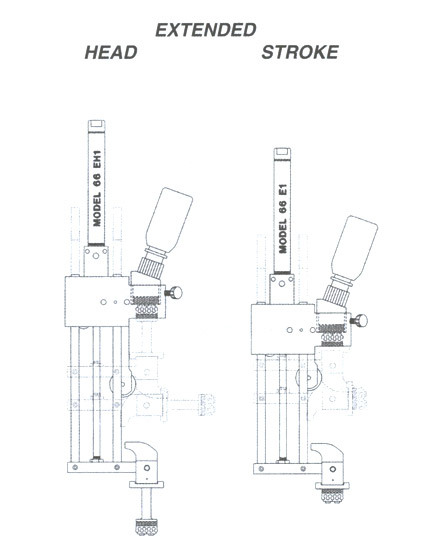 Drawings of typical extended stroke and extended head marking machines are shown below. Cylinder stroke extensions of 1", 2", and 4" are a standard option (other length extensions are available - consult factory) and are often used when the machine must set back further from the surface to be marked than standard machines. A 1" extended head is available as a standard option on most models and is used primarily to mark in recessed areas. Please note that extended machines may have correspondingly higher overall heights, somewhat slower cycle speeds, and precision of marking registration can become slightly more variable with longer extensions. Dimensional drawings are available in the Downloads section. Many models have been made to fit specific marking applications. Several common modifications to both the basic and extended models have been split reservoirs, metal heads, and custom marking heads for marking radiused surfaces such as metal tubing, rubber hose and brake pads. Split reservoirs are used to distribute different colors or types of ink with the same motion of the marking head. Metal heads of various designs have been made for marking on typically rubber or conformable surfaces. Additionally, custom heads to mark as much as one third of the way around tubular surfaces have been designed. Since each application tends to be different, it is best to consult Sprinter or your Sprinter representative on specifics of the application so a feasibility study / quotation may be prepared. Single machine trials are recommended for initial orders. For sample photos of custom heads and reservoirs visit custom marking heads/reservoirs in the drop down menu under Products. For optimal Sprinter machine performance, it is highly recommended that one of the brackets shown below be used. This will assure the marking head can be aligned and positioned accurately with the surface to be marked. These brackets will allow for changes in parameters of manufacturing conditions and easy repositioning on job changes. In the vast majority of arrangements the relative positioning bracket shown below will be the ideal bracket for this required adjustability. The brackets are illustrated and discussed more in detail below. Optimum clarity of marks are obtained with parallel and lightest possible contact of the marking head with the surface to be marked. Each mounting bracket provides a swiveling action of the marking head from front-to-back and left-to-right. In addition to the micro-adjustability and swiveling action, each bracket has a front-to-back and left-to-right 5/16 inch range of travel to allow quick repositioning of the marking head. The difference between the two brackets lies in the mechanism to swivel the marking head. The relative positioning bracket relies on manual adjustment to loosen the appropriate bolts and manually swivel the marking head. The micro-adjusting bracket provides a controlled "fine tuning" capability of swiveling the marking head on a controlled basis. The relative positioning bracket is ideal for the majority of applications. Consult factory for further discussion if there is any question on which bracket might be more suitable. Machine and bracket dimensional drawings are available upon request. If either bracket would not fit into restriced space requirements, caution must be exercised in any alternate mounting technique to assure that all the adjustability and alignment of the marking head as outlined above is maintained. Optimum clarity of marks are obtained with parallel and lightest possible contact of the marking head with the surface to be marked. A less common mounting option is to mount the machine directly to the frame body or a locally designed bracket. 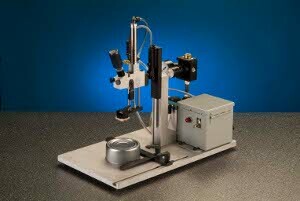 In this option a provision must be made in mounting the machine so that the marking head can easily adjust and align with the surface to be marked. To insure the best possible results it is necessary that a provision for both adjustment and alignment of the marking head as indicated in the above brackets be provided when engineering the mounting arrangement. 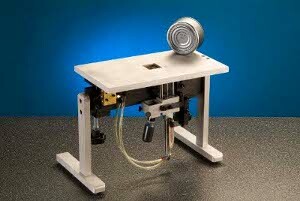 The benchmount or benchtop base units accomodate either mounting bracket to allow mounting of any machine model. The ink supply from the ink bottle to the ink pad is gravity fed on standard models. Any mounting orientation is possible as long as ink is being fed by gravity. Rotation of ink reservoir assembly will handle most mounting orientations. In upside down mounting orientations (where the ink must feed against gravity) a wick is used in the reservoir assembly to assure continuous feeding of ink to the pad (see above Ink Reservior Assemblies section). Since each customer can have a different preference, a common system is not supplied for cycling the machine but left to the customer to determine the most ideal method. A common way to signal retraction is to use a Reed/Hall effect switch, which senses when a magnet on the piston (Standard on base Models 44, 66, 88, 1010, 416, 616, 816; not available on Model 22/28) has come into position at the bottom of the piston stoke. Upon sensing the proximity of the magnet a signal is sent to the four-way valve to return the marking head to the retracted position. Another way to return cycle the machine to the ink supply position is utilizing a micro-pilot actuator switch (installed on the rod-end port of the air cylinder) and flow controls that restrict the flow of air. This switch senses the movement of air thru the line. When the marking head is in full contact with the surface to be marked, the switch senses an absence of air movement which immediately signals the four-way valve to return the marking head to the retracted position. This switch is available as optional equipment because of its uniqueness and applicability to the equipment operation. A broad variety of inks are offered that are specially formulated for compatibility with the Sprinter Marking machine. A complete stock of dye and pigmented inks to mark virtually any surface, absorbent or non-absorbent is available in a range of colors (including white) to suit customer needs. Normally one of the standard Sprinter alcohol-based (dye and /or pigmented) ink grades meets most customer's requirements. These inks typically are dry-to-touch in 2 seconds or less on most nonporous surfaces. If necessary, custom ink can be formulated to meet your specific marking needs. Due to the numerous possible ways and range of customer preferences to provide a control system that both extends and readily retracts the marking head, this function is typically assumed by the customer. If desired a control system package can be quoted for a specific application. At a minimum a four-way valve to control air flow, flow controls, a signal actuation device to initiate marking action, and a signal actuation device to retract marking head is required. A manual override switch near the operator station to extend the marking head for positioning of marking head to surface is recommended. Additionally a shut-off valve to release air pressure from retracted marking head should be provided. This allows operator ease of extending marking head to remove the marking head for message changes. All units are warranted to operate free of defects for a period of one year from date of delivery. Within the warranty period no charge will be made for either parts or labor should any part of the assembly become defective through normal use. 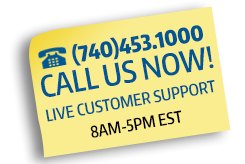 Request for return of any unit for warranty claims must first have factory authorization. Sprinter marking machines are covered by US patents 4,962,703 and 5,000,091 and Canadian patents 1,321,102 and 2,019,999. 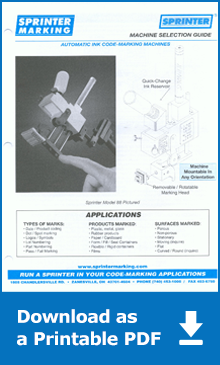 Sprinter is a registered trademark of Sprinter Marking, Inc.
Sprinter Marking, Inc. reserves the right to alter design and/or specifications of all machines without notice as part of ongoing product improvement/development. All equipment is made in United States of America.